Seventeen shooting deaths at Marjory Stoneman Douglas High School in Parkland, Florida, triggered a student protest that reverberated throughout the country. For some, however, marches and speeches on television aren't enough. "It has been building up in me for a couple of years. I wanted to do something about people accessing multiple-firing weapons to release how I feel about this," said Ruth Jenkins. "So I decided to do something I know how to do." Jenkins came up with the idea to produce "A Different Kind of Gun Show" as a fundraiser for Moms Demand Action for Gun Sense in America, a national organization created to demand action for common-sense gun reforms. "A Different Kind of Gun Show," is a compilation of one acts and poetry about gun violence. It will be performed by teenagers from metro-area high schools, along with several adult actors. Performances take place at 7 p.m. Friday, July 20, at the First Unitarian Church in Portland; Saturday, July 21, at Willamette Falls Unitarian Church in Oregon City; Friday, July 27, at the Hollywood Senior Center; and Saturday, July 28, at the Multnomah Arts Center. Tickets are $10 and $8 for seniors and students; all proceeds go to Moms Demand Action. Jenkins will direct all four shows; she has a degree in theater arts and has directed student productions at Da Vinci Arts Middle School in Portland. She also is the co-founder of ComedySportz Portland, which makes use of competitive improvisational techniques. The four one-act plays include "Lockdown," "I Am a Gun," "Clowns With Guns" and "The Talk." "Lockdown" is a realistic play about a group of students in a classroom who have been plunged into a lockdown situation while a school shooting is taking place. "This shows that kids are going to school fearful. As the play progresses, the tension builds," Jenkins said. "I Am a Gun" is told from the point of view of the gun; an actor portrays the gun and describes his methodology during a school shooting. Jenkins described "Clowns With Guns" as a "dark, vaudeville-style play, something between a circus and theater." Characters include stereotypes like a cheerleader, a stoner and a bully. "The Talk" is a piece written by the performers Jadon and Jamie Montgomery, who play a son and his father. Jenkins brought the idea of a father telling his son "what he has to do to come home alive. They adapted a simple conversation about what a black guy has to do to be safe." "A Bullet into Bells" will feature poems about gun violence, some focusing on how "gun violence comes from a need to keep people in their place," Jenkins said. "A Different Kind of Gun Show" will open with a speech about the mature content of the show and about how all the students in the cast knew ahead of time about the nature of the plays. "We are not here to frighten people," Jenkins said. 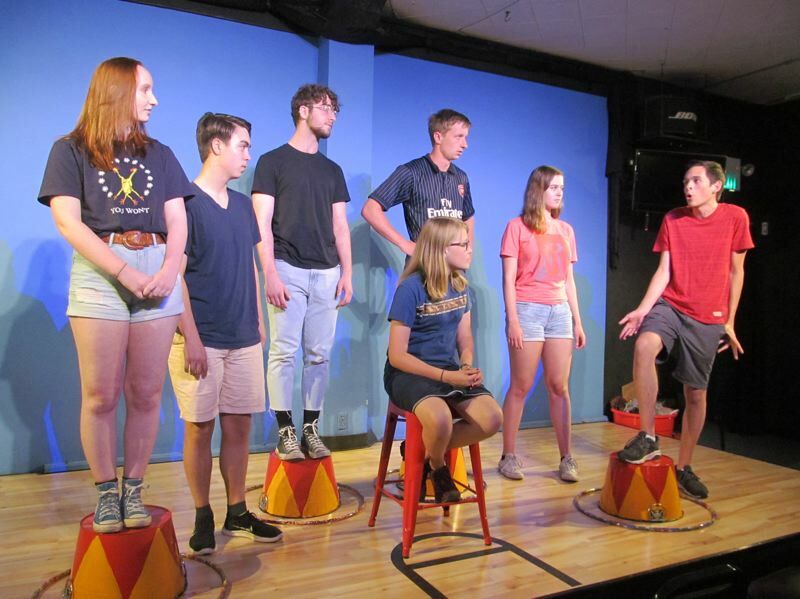 Some might question the appropriateness of young people being in a show about gun violence, but Jenkins believes that "these kids, along with the Parkland students, are willing to stand up and say 'we're not having this.'" Cast members weighed in on the issue of appropriateness of the subject matter, and all agreed that gun violence is an issue that affects young people, and must be addressed. Cowan Jenkins, 21, is a graduate of Grant High School and Ruth Jenkins' son. He plays a bully in "Clowns With Guns" and said he wanted to be part of the show because many people don't see how even peripheral involvement in a school shooting can emotionally affect people. Theater can provide one of the "most healing ways to discuss" an issue like this, he said. "We can't shy away from it. We have to address it, and all the people in the play are mature and have thought about it," Jenkins added. "Many of my peers are disappointed by the adult response [to school shootings] and want to see change," said Aiden Durias, a 17-year-old graduate of Metro East Web Academy in Gresham. He plays the shooter in "Clowns With Guns" and noted that although the play does not offer a solution to the issue, it is "giving a wake-up call and satirizes the terrible cycle" of school shootings. His monologue in the play gives some idea about his character's motivation, but does not offer up a "nice, neat box as to why he did it," Durias said. It is "paramount [that students] get involved, and it is up to us to raise awareness" about the harm that can come from giving people access to weapons, he added. Fiona Jenkins, 18, is Ruth Jenkins' daughter and a recent graduate of Grant High School, where she directed "Lockdown" as a theater class project. She chose the one act because it dealt with an issue she cares about, and she likes the idea of using theater to prompt discussion. Fiona Jenkins is in both "Clowns With Guns" and this production of "Lockdown," and said it is appropriate for young people to speak out about gun violence. "We are the ones in school who have to deal with the potential of someone coming in with a gun," she said. "It is a reality we have to face and we have to do what we have to do to change that, so the reality doesn't become commonplace." "The first step in solving problems is recognizing there is one," said Rachel Michtom, 18, a recent graduate of Lake Oswego High School. She plays the "chill pill" character in "Lockdown," telling the others to stay calm, be quiet and don't open the door. "Nothing in 'Lockdown' is weird — it's very real. You don't see cameras in a lockdown situation; you see the emotions of what is happening," Michtom said. Max Bernsohn, 18, just graduated from West View High School in Beaverton. He plays the "class goofball" in "Lockdown" and the stoner in "Clowns With Guns." The human element puts a face on the people who are affected by violence. "It turns them human, rather than just a statistic," Bernsohn said. As one of the youngest members of the cast, 15-year-old Jade Leeman, a Grant High School student, said the issue of gun violence is important to her, and she wants to see change. She plays the character Prayers in "Clowns With Guns," in partnership with Thoughts, another character. "We are part of the metaphor, and we don't do anything besides dispose of the bodies," Leeman said. To those who think a 15 year old is too young to be in a play about gun violence, she points out that she is at risk of being shot in school. "It is uncomfortable, what we are discussing, but death is a true fact — we are at risk," Leeman said. "Making a play about a fact of life is making a point that it shouldn't be a fact of life." When/Where: 7 p.m. Friday, July 20, First Unitarian Church, 1011 S.W. 12th Ave., Portland; July 21 at Willamette Falls Unitarian Church, 710 Sixth St., Oregon City; July 27 at the Hollywood Senior Center, 1820 N.E. 40th Ave., Portland; and July 28 at the Multnomah Arts Center, 7688 S.W. Capitol Highway, Portland. Tickets: $10, $8 for seniors and students; purchase with cash at the door or in advance online at portlandcomedy.com/buy-tickets or by calling 503-236-8888, ext. 2. More: Shows will be 90 minutes of performance and 30 minutes of talk back with a panel. Due to mature themes and language, this show is recommended for ages 12 and up.